Every year from 1 – 7 August is World Breastfeeding Week and the theme this year is “Sustaining breastfeeding, together!”. 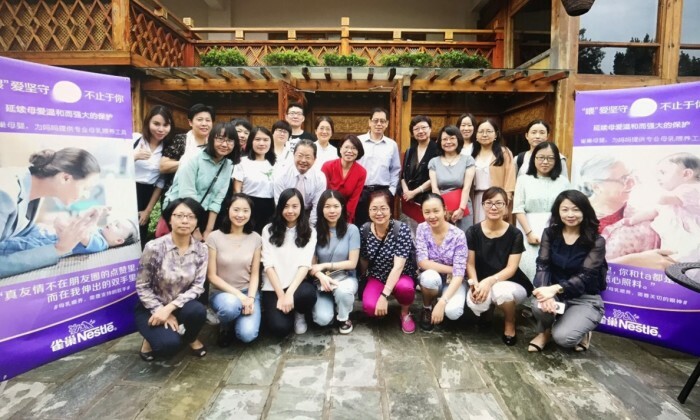 As an infant nutrition expert that has long kept an eye on maternal and child health in China, Nestlé held a series of publicity activities themed “Together, holding on to breastfeeding!” during this period, to call on the whole society to pay attention to breastfeeding. The brand will carry out a series of activities during Breastfeeding Week to generate support from parents, family members, colleagues and friends. “MING research findings show that there are 42.8% of infants below 6 months of age exclusively receiving breastfeeding and there is still a lot of room for this number to rise,” said Binu Jacob, vice president of Infant Nutrition, Nestlé Greater China . It is clearly put forward in the “National Nutrition Plan” recently launched by the State Council that the breastfeeding rate among 0 to 6-month infants should reach 50% or above by 2020 and realisation of this goal requires the “efforts of everyone and every organisation”. In addition, as the first infant formula producer included in the FTSE Social Responsibility Index, Nestlé promises not to advertise or carry out any promotional activities for infant formula for 0 to 12-month infants to encourage breastfeeding. Alibaba recently opened its country office in Malaysia to bolster the technology capabilities..
Six months after it closed its flagship in Central, the Swedish fashion house turns on its lights on one of the tallest media plac..